As I bent down to snip the basil, I heard an extremely loud rustle emanating from the top of the fig tree about 4 yards away. And there he was: my arch-nemesis Groundie, fat and happily munching away on the fruit of my labor. I don't know what possessed me, I saw red I guess and, without thinking about what I was doing, I stood up and started running across the extremely short distance that separated us, screaming like a banshee and welding those shears in my fist just like the shadow behind the shower curtain. When I got about a yard away from the tree, sanity kicked in and it occurred to me that I had absolutely no plan whatsoever for my mano a mano encounter with that 40 pound fur covered fig-and-perennial destructo machine. Thank goodness, at that precise moment, Groundie hurled himself from the very top of the fig tree onto the ground behind and high-tailed it down the bank towards the river and his den. Shaking,, I realized what a close call we'd both had: Groundie delivered from a wanton attack by a crazed woman, and me, completely mauled by an irate ground hog, fighting for his very life. Truth be told, I wasn't going to advance a single other step once sanity kicked in, but I was very satisfied at completely scaring the wits out of him. With my video fast approaching, I grabbed whatever figs I could carry and raced into the house, intent on doing something with them, if only to deny Groundie the satisfaction of resuming his feast while I worked. I quickly hurled this delicious poaching liquid together and threw the figs into the oven, just as the doorbell rang. I'm happy to say that with just a quick dab of lipstick, I was ready to go with the video, and I expect, the audience watching, will be clueless as to the virtual life and death struggle that served as a preamble to the shoot. 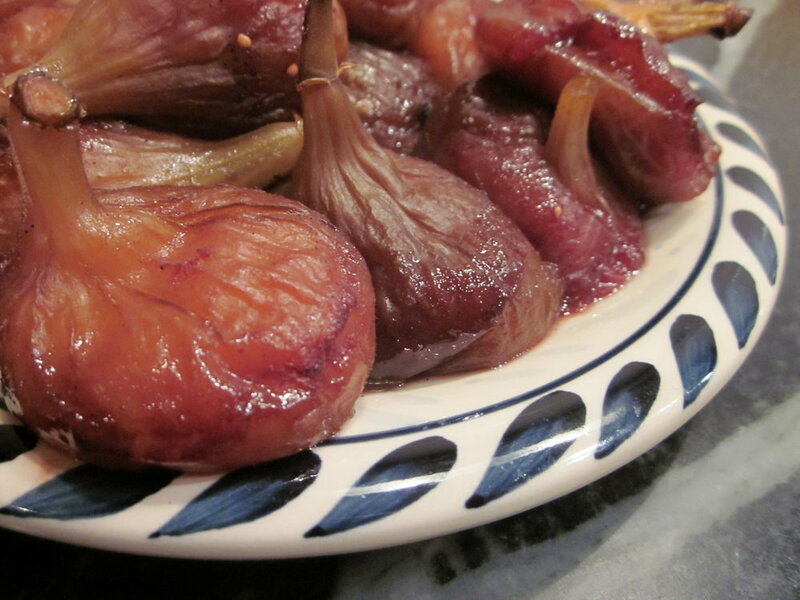 Imagine my delight when I served these glistening figs over some vanilla ice cream to Jeff for dessert that night. His eyes grew large at the epic tale of their genesis, at least I thought they did, though I couldn't be sure since all of his attention seemed to be fixated on his bowl. Arrange figs, stems facing up on a glass baking dish so they are relatively tightly packed but not touching. Pour the port, wine, honey and orange juice over the figs and then submerge the remaining ingredients in the liquid around the figs. Cover the dish with foil and bake for 1 hour. Remove the foil and continue to bake for 45 minutes more, basting occasionally with the accumulated juices. Remove from the oven and let them cool completely.